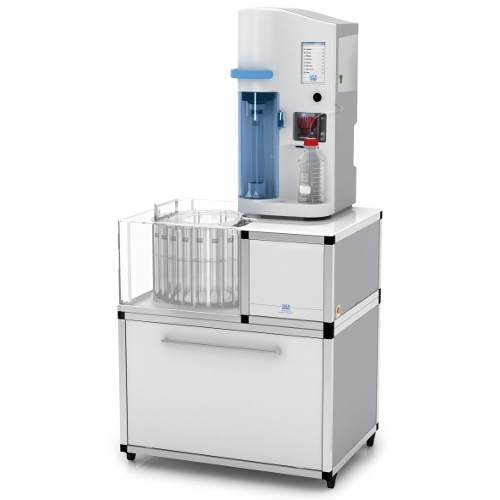 Model UDK-159 : VELP Fully Automatic Interactive Kjeldahl System with In-built Titration System (TEMS Technology). VELP UDK-159 Fully Automatic Distillation & In-built Titration System for analysis of Kjeldahl Nitrogen, Protein Nitrogen, Nitric Nitrogen (after reduction), Phenols, Volatile Fatty Acids, Cyanides, Sulphur Dioxide, Alcohol Content etc. according to official procedures as per AOAC, EPA, DIN, ISO etc. 30 predefined official method stored and 24 customizable methods for user selection with Calculation, reporting and data storage. Automatic distillation procedures including Sample dilution, water addition, alkali and receiver solution addition, steam generation, distillation, built-in titration, calculation, reporting, storage of data, tube draining and waste collection. Steam generator without level sensor. Alkali resistant technopolymer splash head. Titanium condenser for high performance and water saving. Data storage capacity 100000 values. Display 6” colour touch screen. Model UDK-149 : The flexible VELP solution for Automatic Distillation (TEMSTechnology). UDK-149 AUTOMATIC DISTILLATION UNIT 230V/50Hz Programmable with facility to Titrator Connection, with high reliabity with safety characterstics for analysis of Kjeldahl Nitrogen, Protein Nitrogen, nitric nitrogen (after reduction),phenols, volatile fatty acids, cyanides, Sulphur dioxide, alcohol content etc. according to official procedures (with TEMS Technology). Data Storage upto 50000 values. Display 3.5” colour touch screen. Model UDK-139 : The reliable VELP Semi-Automatic Distillation (with TEMSTechnology). UDK-139 SEMI-AUTOMATIC PROGRAMMABLE DISTILLATION UNIT 230V/50Hz for analysis of Kjeldahl Nitrogen, Protein Nitrogen, nitric nitrogen (after reduction),phenols, volatile fatty acids, cyanides, Sulphur dioxide, alcohol content etc. according to official procedures (with TEMS Technology). 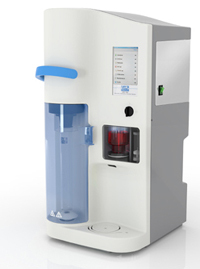 Model UDK-129 : VELP Entry-Level Solution for Kjeldahl Analysis (with TEMSTechnology). UDK-129 DISTILLATION UNIT 230V/50Hz for analysis of Kjeldahl Nitrogen, Protein Nitrogen, nitric nitrogen (after reduction),phenols, volatile fatty acids, cyanides, Sulphur dioxide, alcohol content etc. according to official procedures (with TEMSTechnology).